This was the first OSCON I ever attended. I had a great time and I met a lot of amazing people. I’m definitely going back next year. Much of what I discussed in the talk came from work I did on the Plaxo widget, and the point of this talk was to share the techniques I’d learned and also to raise awareness and debate of the larger issues and privacy/technology tradeoffs involved. 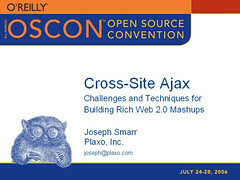 I’ve covered this talk in more detail on Plaxo’s blog (thanks Plaxo for sending me!). Kevin Yank also blogged a summary of the talk. Joseph, why a blog, and why now?